The Excalibur Hotel Las Vegas has no less than four outdoor pools, including one with a water slide which is open from 10 a.m. to 6 p.m. daily. The other three pools include the Drenched Pool, which is open from 9 a.m. to 7 p.m., the Main Pool, which is open Saturdays and Sundays only, and an adults only pool. There is plenty of seating, or if you prefer, you can reserve a cabana for the day. You and the kids can enjoy an inexpensive lunch or snack at the poolside café, Drenched. Regretably, hotel guests must pay $10 each for pool entry. Cabana cost: Each of the 19 cabanas feature flat a screen television, a ceiling fan, mini refrigerators, a snack basket, complimentary raft, safe, and personalized service. Raft rentals: 1 raft is $7 and 2 rafts for $10. You may not bring your own raft. 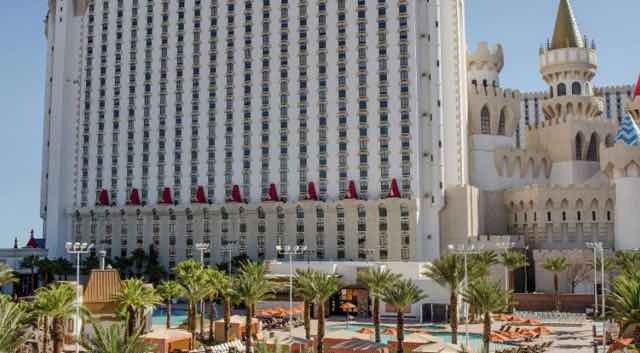 Pool hours: Open Spring through Fall from 9 a.m. to 5 p.m. Summer hours are 8 a.m. to 8 p.m.
Can non-Excalibur hotel guests use the pool (day pass):Yes, the pool side package ($40-$50) allows for non-guest access. Water slides: Two slides are located in the children's pool. One is a smaller slide for little tots, the other, larger slide for ages 5+.